This kit includes everything needed for a school or youth group to organize its own 1-, 3- or 7-day Blackout, recruit participants through Facebook and Twitter (irony duly noted), notify the local media of their experiment, and document the results using journals, videos, surveys and blogs. One of the first and most popular anti-bullying videos, Gum in my Hair is back with a comprehensive update. Gum in my Hair Version 2.0 includes new research, all new interviews and a new approach to tackling the age-old problem of bullying in schools. 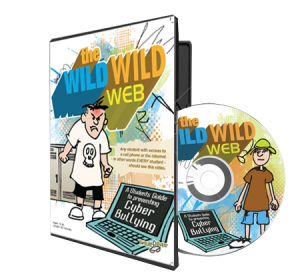 From the producers of the popular anti-bullying program “Gum in my Hair” comes the brand new DVD that not only provides students with updated information about bullying but specifically focuses on a new form of harassment known as cyber bullying. 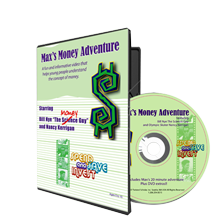 Max’s Money Adventure is a 20 minute DVD that tells the story of an overgrown kid who somehow missed the boat on all matters fiscally related. Through trial and (considerable) error, Max explores the world of money: where it comes from, why it holds value, how checking accounts, ATMs and credit cards work, and the differences between investing and saving your money. © 2018 Twisted Scholar. All Rights Reserved.